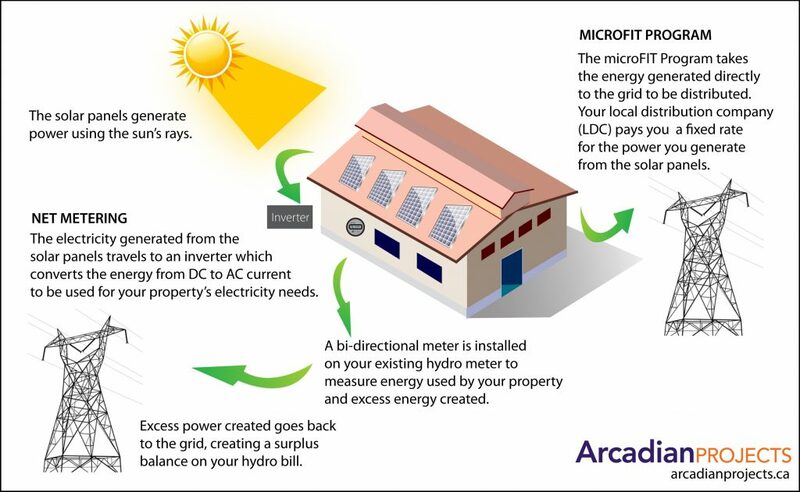 Net Metering – Arcadian Projects Inc. Many small and large electricity consumers are looking at Net Metering Solutions to help offset or reduce their hydro bills. However, what exactly is Net Metering? Moreover, what is the difference between Net Metering and microFit? Let us help explain. Solar photovoltaic (PV) systems on your building or property, work extremely well with both Net Metering and microFit programs. The installation of a Net Metering Solar system, (or other renewable technologies such as wind) allows you to use the power generated from your system, to reduce your electricity consumption cost. Most Hydro Companies are switching approved Net Metering customers back to “Fixed Rate Billing” to simplify the requirement of the bi-directional meter and calculations. MicroFit is a Government incentive program, promoting the use of renewable energy systems for businesses and homeowners. The power generated from your renewable solar system is sold at a fixed rate to your hydro company for a set period and is connected to the hydro grid with a separate meter to track energy production. Contact Arcadian for a free site assessment to determine your system size. Trying to get a general idea of size and cost before you call us? Try our Net Metering Calculator. With a Net Meter System, all power generated by your system will go directly to your property’s main electrical service panel to satisfy your power needs. Energy generated beyond your needs will be fed back into the hydro grid. A new Bi-Directional Meter is installed into your existing meter base. This meter will record all energy consumed by your property from the grid. The excess energy produced from your solar system travels back past the bi-directional meter and into the grid, winding the recorded kWh off your meter. In the event your system produced more energy in a 12 month period than your property used, you would have a surplus meter reading. Some buildings or houses have enough usable roof space to install a renewable solar system large enough to wind off all the property’s electricity usage for the year. However, your Net Metering System must be sized correctly to balance your solar energy generation and your electricity consumption. For example, An average house uses between 9000 and 10,000 kWh per year. A 10kW, 40-panel system produces an average of 12,000kWh per year, creating a surplus 2000kWh balance on your hydro bill. You can carry this excess balance on your hydro bill for one year to offset additional power needs, after a year your hydrometer will be re-set by your Local Distribution Company (LDC). Therefore it is important that your net metering system is sized correctly to avoid creating free power for your LDC.